There are few game premises that are as exciting as getting to be a cat. Chris Chung showed just how fun it was to be a mischievous one with his first-person title Catlateral Damage, and now Cattails provides another take. This simulation role-playing game by Falcon Development stars the player as a feral cat trying to survive in the tough conditions of the wilderness. However, the main character doesn’t have to tough it out alone. 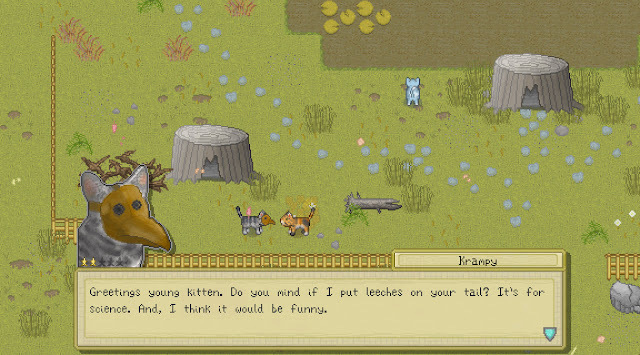 Cattails features a whole cast of characters, as players quickly get taken into a group of wild felines. While some of these cats are used as shopkeepers, others are simply there to chat or to be romanced. 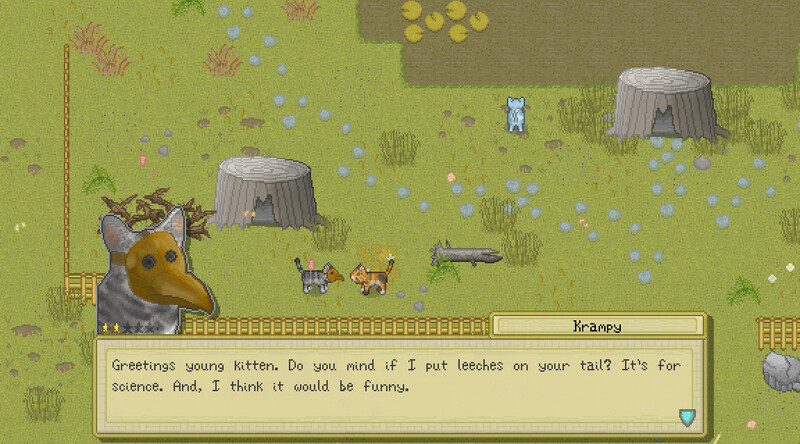 The top-down open-world that players can explore actually features several different clans of cats that can either be won over with gifts or be turned into enemies if players choose to fight them. 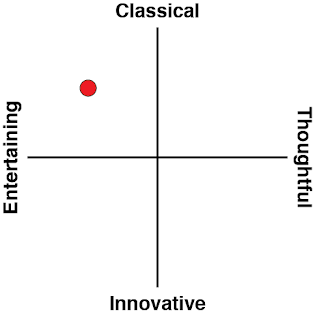 The bulk of the game is quite repetitive in nature, as it is very much a survival game as advertised. That means players have to spend a lot of the time strolling about the environment while looking for other animals to prey upon. 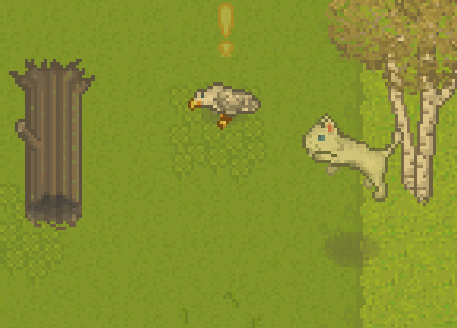 The actual hunting is quite stealthful, as players can get into a crouch position in order to sneak up upon unknowing creatures, and then they can pounce upon them with a press of a button. 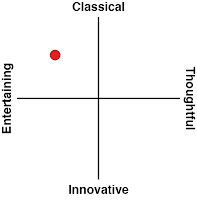 It’s not the most complex system, but it’s one that works just fine and is enjoyable enough to execute. The core structure has players trying to bring back the forest’s guardian, which is done by offering certain items to an altar. Occasionally, there are some puzzles to figure out, but they’re never overly complex. Most of the time, players get a list of what they need to gather, and it’s then up to them to survive long enough in order to make some long-term progress. It’s far from the harshest survival game, as there are only a few in-game systems to worry about, which means the focus is more on the core gameplay rather than stat management. If you’re not playing on the hardest difficulty, it’s quite easy enough to gather enough food for a few days and then not have to actively hunt. As mentioned before, it’s possible to become enemies with the other groups of cats. These felines will then sometimes be caught patrolling square sections of the map, but they can’t really give chase out of their location. So, by simply avoiding it, players can stay away from conflict rather easily. This is a good thing, as the actual non-stealth combat feels staunchly stiff and unsatisfying. It also becomes an issue when exploring the hidden caves, that are filled with all types of goodies to be brought back to town. That lack of truly enjoyable combat really hurts Cattails, and the game probably would have been better off by foregoing the violence. The moments I really enjoyed was gathering gifts to romance other cats, and then eventually settling down. 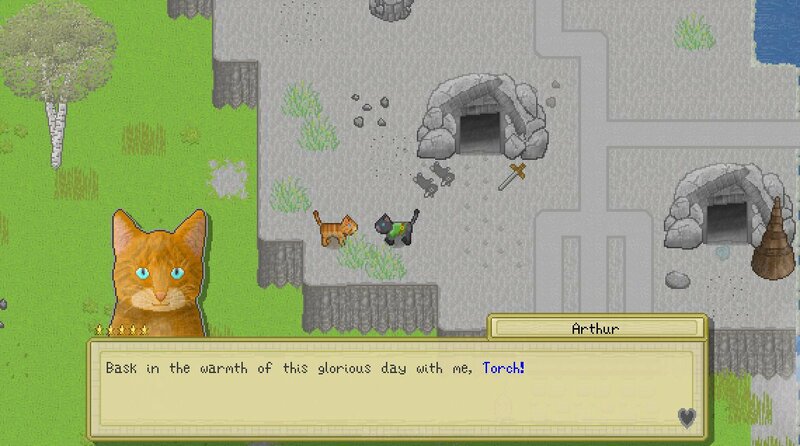 Not only can you get married in the game, but you can also have kittens that will follow you out into the world. Providing for a family is a more stressful experience (one that is akin to real life), but who doesn’t want to bring more kittens into the world? Like most RPGs, players will gain skills and new abilities as the game continues. As I went along, combat eventually got less frustrating thanks to using my experience points on perks, but it was never a true highlight. Both the weather and the seasons themselves can change during Cattails as well, so there’s a pretty in-depth simulation behind its cute exterior. It’s just not one that I found myself truly wanting to be in a lot of the time. The best parts of Cattails are when you’re just getting to take in the scenery, hunting some field mice, and then chatting with other cats. There’s so much charm in the sprite work and dialogue, so it’s all the more disappointing when you’re cast into dull combat exchanges simply because a RPG needs fighting. Some variance from the traditional survival game design would’ve been appreciated, as it stands as a charming survival title that can’t quite measure up to the best in the genre. Still, you can do far worse, and who will really complain about getting to be a cat for a while?